Travel Tots - Lightweight 2pc. 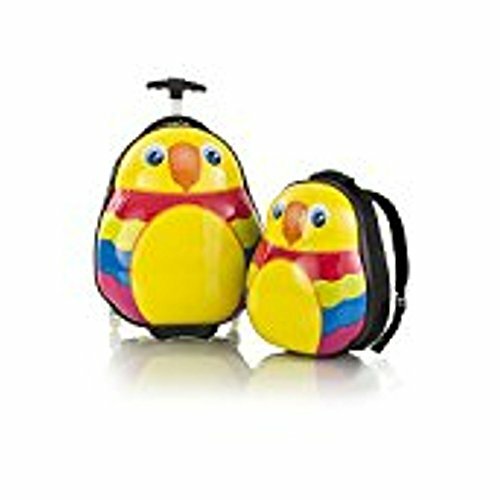 Kids Luggage & Backpack Set The Travel Tots 2pc. Kids Luggage & Backpack Set is the perfect travel companion for your little ones. The Travel Tots collection was created by Heys with the unique characteristics of children in mind, incorporating several design features that benefit children. piece has been printed with colourful and vibrant artwork adding loads of fun to travelling for the kids and the entire family. The luggage print is protected by a layer of clear coat which also gives it a beautiful glossy shine. The patent-pending design of this case also allows the wheels to protrude out keeping the case elevated preventing the bottom of the luggage from touching the ground. With the luggage only weighing in at a mere 3.5 lbs., children can wheel these fun cases around, as they also feature our inline skate wheels that make rolling even smoother. Both the luggage and backpack piece have zipper closure system, when opened reveals a beautifully lined interior. MATERIAL: We provide classic designed and gorgeous new easy to carry Kids Travel Tots Luggage & Backpack Set from Heys. These cases are the perfect travel companion with its inline wheels and fun design. Made of ABS / Polycarbonate composite. SIZE & WEIGHT: Ideal size for Easy to Carry and luggage measures approximately 18" x 13.5" x 9" - 46cm x 34cm x 23cm and Backpack - 13" x 10" x 5.5" - 33cm x 25cm x 14cm. For its medium size, it is flexible to carry and packaging. COLOR INFO: Very exclusive combination of color make an attractive look for kids. Unique Parrot Shaped with multicolor combination make an awesome look on it. FEATURES & DURABILITY: Vibrant artwork adding loads of fun to travelling for the kids and the entire family. The luggage print is protected by a layer of clear coat which also gives it a beautiful glossy shine. ADDITIONAL INFO: The patent-pending design of this case also allows the wheels to protrude out keeping the case elevated preventing the bottom of the luggage from touching the ground. Both the luggage and backpack piece have zipper closure system, when opened reveals a beautifully lined interior.